We are starting to delve into the data from all your survey responses and drafting a paper describing the study’s potential. Over the next few updates, we will share some of the details with you. One concern in an online study like Genes for Good is that data may not be as reliable as data collected in a traditional study, so a main focus right now is examining data quality. We are looking at this in many different ways and, so far, things look good! Below, we compare Genes for Good data with previously reported findings from SHIELD and NHANES, two large nationally representative studies. It is long been known that the risk of diabetes increases with BMI. 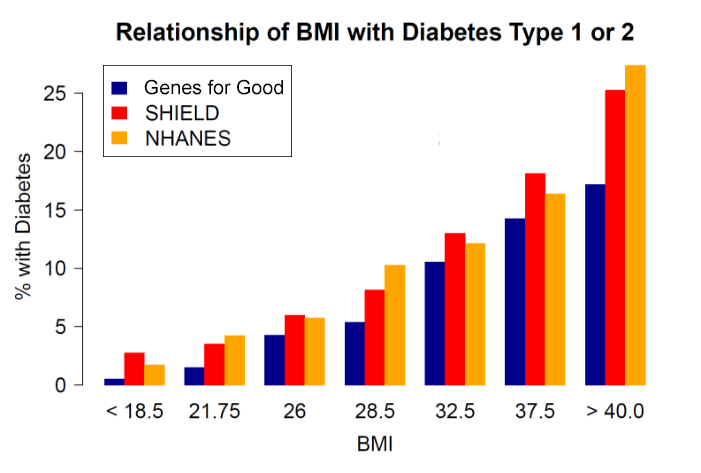 In the chart below, we compare the proportion of individuals with diabetes in different BMI categories, in Genes for Good, SHIELD and NHANES. Based on your responses, we see that the observations using Genes for Good data are generally consistent with what is observed in these other U.S. population studies. This is a promising sign!